Weeks ago I talked of another blog on the science behind the mushrooms planted below the Bernheim Forest parking lot. I’ve done my research. One of the problems with suburban development is water pollution from automobiles. Most of it is motor oil, gasoline, and grease, but brake and transmission fluids nurture very few living things. Many cities are trying to limit development around the watersheds that feed their reservoirs: if enough of that stuff gets into your lake, the water tastes bad. Get more and you start killing off the fish. Go a little further and it costs an arm and a leg to clean it up for human consumption. Bernheim Forest wants to preserve their arboreal wildlife, and they have installed cutting edge technology to clean up automotive fluids while creating a cash crop, or food for some of the animals living there. Neither of us knew this, but we share more common DNA with an oyster mushroom than with say, a carrot, a pine tree, and blessedly, pond scum. That is because you are an animal, and the last three are plants. Plants make their own food from dirt, water, and sunlight. Animals can’t do this, nor can fungi. Plants were the first earthly life forms. After many millions of years, we and fungi split off from the plant family tree (maybe that’s why they call it a tree?) forming our own branches. Soon after, we and funguses parted ways. Like humans and every other animal that has a stomach, fungi attract beneficial bacteria to their digestive systems. For people, that’s one of the reasons doctors don’t like to prescribe antibiotics except when really needed. For mushrooms, and oyster mushrooms specifically, there are several species of bacteria in their roots that love to munch on hydrocarbons. Anything with carbon is generally considered to have come from a living organism, and as such, something somewhere has probably evolved to eat it. 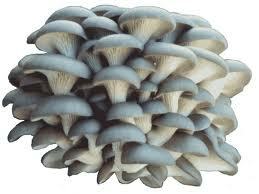 Oyster mushrooms have more of these bacteria than any other easy to grow fungi, and there is a huge market for oysters. Thanks to the bacteria that break down the hydrocarbons, eating waste oil by-products does not change the flavor or nutritional value of the oyster mushroom. Best of all, it only takes a few crops of mushrooms to clean up a spill. The science here implies a much faster way to remediate nuclear waste as well. Use similar bacteria in the roots of fast-growing willow trees. Plant the trees on nuke waste sites. Harvest the small limbs and leaves and dispose of them as nuclear waste (burning with smoke capture offers promise). Repeat as needed. It might take several cycles, but the alternative is to bury the topsoil. It ain’t cheap, but the current alternative means waiting 50,000 years for the bad stuff to decay.